Read Forever 29-Part One for a recap of “the early years” of Joie de Vivre. Photo shoot at the house and Jeff uses our Italian armoire as a backdrop to highlight our Provençal pottery. 40 pages. Notable: Maison Pébeyre truffle products, Hénaff pâtés, Puget Olive oil, Malongo Grande Réserve coffee, Provence napkins and placemats, Pré de Provence gift soaps. I launch our website, frenchselections.com. Timeless Brasserie series by Pillivuyt is my inspiration this year. 48 pages. Notable: first catalog to offer Fabrique Délices fresh sausages and pâtés by mail. First-boil truffles by Pébeyre; Aromont sauces and stocks; Tarbais beans; Délice de l’Amandier, first gluten-free cake; Côte d’Or chocolate; pastilles Vichy, Anis de Flavigny, and Cachou Lajaunie; La Française hollowed candles; lavender linen water. Glassware by La Rochère, the oldest glassmaking factory in France (since 1475!) 52 pages. Notable: fish soup; Gold medal winner Château Virant extra-virgin olive oil, Guyaux chocolate truffles, Cémoi chocolate cerises, candied fruits. Also, our famous raclette grill and Digouin vinegar maker. Because today’s specials are still handwritten with white chalk. 52 pages. Notable: Jean de France rosette, the only saucisson that ever was legally (albeit briefly) imported from France; Connétable sardines; La Tisanière herbal teas; Francine crêpe mixes; silver dragées; Le Petit Prince dinnerware; Marius Fabre soap flakes. Beautiful soap and toiletry collection from southern France. 52 pages. Notable: Fabrique Délices pâtés en croûte; Giraudet pike quenelles in Nantua sauce (JDV was the only US retailer to offer this product;) Artzner goose confit and rillettes from Alsace; cod brandade from Nîmes; Eiffel Tower tabletop; Grand Hôtel flatware; Marius Fabre liquid soap. Yes, it’s true: cassoulet is finally here again. 52 pages. Notable: Folies Fromages, great jams to pair with cheese (that’s when that whole trend started…) Not just cassoulet but also foie gras and pâtés from our Canadian cousins; truffle condiments from Les Truffières de Rabasse; Arnaud extra-virgin olive oil from Les Baux; L’Epicurien vegetable confits; chocolate coated orange and lemon zests; silver and gold-plated charms; French music CDs. Coffee is served in the striking Paris mug, along with a dark chocolate square by Monbana. 52 pages. Notable: Pérard fish, crab, and lobster soups; Lubéron appetizer spreads; Blessac crème brûlée mix; caramels Dupont d’Isigny; France wooden cheese platter with Laguiole knife; bowls for chat and chien. La Fée Verte is legal again and very trendy; our French absinthe fountain and accessories take us back 150 years. 56 pages. Notable: Fabrique Délices saucisson sec; Connétable vintage sardines and tuna in oil; Espélette pepper; Biofournil par-baked bread; St Dalfour Gourmet-on-the-go salads; Mirabelle jam! 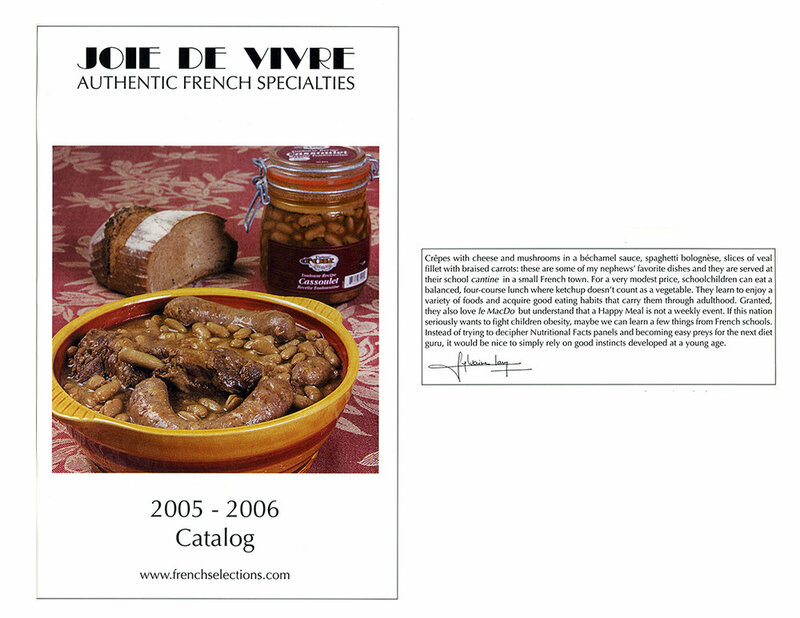 Paris Souvenir tidbit dishes; three exclusive T-shirts, including Joie de Vivre and La Deuche. The Ellesca collection brings aromatherapy into our homes. 56 pages. Notable: Fabrique Délices rosette de Lyon; Blessac dehydrated sauces; Nectar de Bourgogne fruit coulis; boudoirs; fruit cake from Pont-Aven (still mourning this one;) poterie Renault; three more exclusive T-shirt designs, including Merde Happens. Follow me to Part Three.